A lot of what Steve Kennedy knows about bass fishing he learned on West Point Lake from his father. So good at catching bass, Van Kennedy qualified for the 1982 Bassmaster Classic through what is now the B.A.S.S. Federation Nation. Knowing that history, most people would rush to add Steve Kennedy to their B.A.S.S. Fantasy Fishing team for the May 5-8 Bassmaster Elite Series event, the Pride of Georgia out of LaGrange, Ga. But even Kennedy (son or father) might advise not jumping to conclusions: Steve last competed in a major West Point tournament in 2005. “I haven’t been there lately, and I didn’t scout it before cutoff,” Kennedy said, referring to the April 4-May 1 off-limits period for all Elite Series pros. Even though the lake is a new stop for the Elite Series, other Elite pros have competed there. One is Mark Menendez of Kentucky, who won a Bassmaster event on West Point in 2005. Elite anglers who landed a Top 10 in that same tournament include Arkansas pro Scott Rook, runner-up to Menendez; and Brent Broderick of Ohio, who finished ninth. But (Fantasy players, listen up) Kennedy’s reserve of West Point history runs deep. All those childhood hours of family fishing created a base of knowledge he can tap into at will. So even though he hasn’t seen it lately, he has a good feel for how the lake will fish when the 99-angler Elite Series field arrives for the May 2-4 official practice. Kennedy noted that the water level should be close to normal summer pool. That’s 635 feet above mean sea level, according to the U.S. Army Corps of Engineers, which operates the Chattahoochee River impoundment that stretches about 35 miles along the Alabama-Georgia border. Filled in fall 1974, the lake is home to spotted and largemouth bass, with spots being the more prevalent species. The fishery has 525 miles of shoreline and 25,900 surface acres, making it the smallest fishery of the Elite Series season. As in any event, the playing-field size is a condition the Elite Series field has to take into consideration when formulating strategy. Kennedy has. Kennedy noted that the lake fishes differently than when he went there as a high school student with his father. An effort to clean pollutants out of the lake resulted in clearer water, which sent spotted bass populations soaring. The Elite Series field of 99 anglers will compete over four days for a first-place prize of $100,000, a berth in the 2012 Bassmaster Classic and valuable points in the Toyota Tundra Bassmaster Angler of the Year race. See below for details. * First prize: The winner’s prize is $100,000 and a 2012 Bassmaster Classic berth. * Also at stake: Besides a claim on the Top-50 payout list, anglers will compete for points that count toward winning the 2011 Toyota Tundra Bassmaster Angler of the Year title, and for qualifying for the postseason — each $100,000 competitions within themselves. Also, the Top 28 in points at the end of the season will qualify for the 2012 Classic. * When: May 5-8. 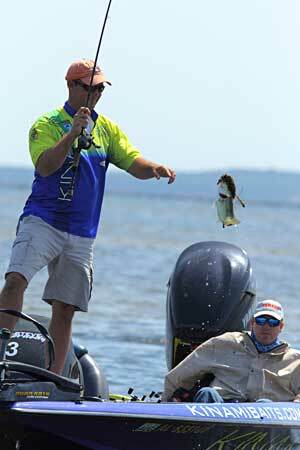 Anglers will be allowed three days of official practice, May 2-4, before the four-day competition begins on Thursday. * Launch: 6:45 a.m. ET. * Weigh-ins: 3:15 p.m. ET. * The cut: The 99-angler field will compete the first two days, then be cut to 50 for the third day. The fourth and final day — Sunday, May 8 — will be a contest among the 12 pros who make the final cut. * Fan fun on site: Kids activities, giveaways and live music are on tap. Yamaha will offer its S.H.O. Demo Tour. For a full list of the fun, check out the Attend an Event pages of Bassmaster.com. * No cost to attend: Launches, weigh-ins and the festival are free. * All-out online coverage: Bassmaster.com will provide complete online event coverage. Features include live, streaming video of the weigh-ins; a real-time weigh-in leaderboard; B.A.S.S. Trakk catch reports; daylong live blogging; from-the-water B.A.S.S.Cam video reports, the live Hooked Up! show with Tommy Sanders and Mark Zona; live hourly updates hosted by Dave Mercer from the Toyota Trucks Hooked Up! stage; daily photo galleries; in-depth analysis; and daily results and standings. * Local sponsor: The local sponsor of the Pride of Georgia is the LaGrange-Troup County Chamber of Commerce.